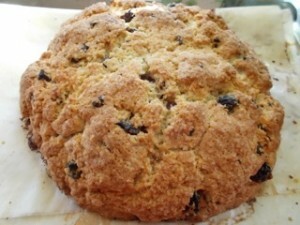 I was listening to the Cooking with Marilyn show today here in Cincinnati and a listener called in to give a recipe for soda bread. She was just taking it out of the oven and “it smells so good I’m going to bake another loaf for tomorrow”, she said. Well guess what? It was this recipe! 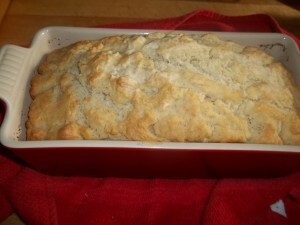 Soda bread is one of the things that makes me think of St. Patrick’s day, but I love a warm homemade soda bread recipe any time of year. 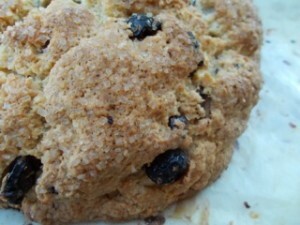 So, why do they call it soda bread? Soda bread is a simple bread recipe that uses baking soda to provide leavening instead of the yeast called for in most bread recipes. I’ve tweaked this recipe a bit and wanted to make sure you have it for St. Pat’s Day. Yum! This is the most moist and best tasting soda bread I’ve ever made. Always gets rave reviews. It would be perfect alongside a simple Irish stew for St. Patrick’s Day. Preheat oven to 375. Mix flour, soda, salt, sugar and butter until mixture is crumbly. Add fruit and toss well. This helps the fruit stay suspended in the bread and not sink to the bottom. Blend in sour cream. Form into mound-shaped circle, about 6 inches wide and 2” tall. Bless the dough to let the devils out (or do you bless it to keep them out?!!. Place on parchment lined (spray the parchment) cookie sheet. Brush or drizzle with melted butter and sprinkle with sugar. Bake 40-50 minutes on middle rack. When toothpick inserted in center comes out clean, it’s done. Substitute regular Greek yogurt for the sour cream. 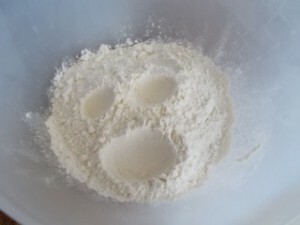 Use a food processor or mixer to make bread but be careful not to over mix. If you make it by hand, cut the butter into small pieces so it’s easier to incorporate. Turbinado is golden in color and is natural. Use milk instead of butter for brushing on top. 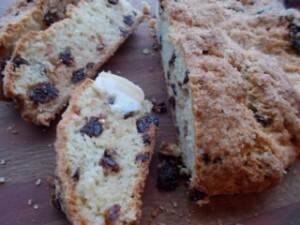 I have several recipes for soda bread. This is a dense, country type bread, best eaten the day it’s made. Preheat oven 350°. 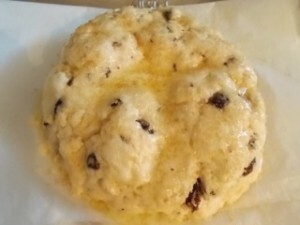 Butter a 9×5 inch loaf pan. Whisk flour and sugar together. Make a well in the center. Pour in beer (if using honey, mix with beer first). Blend well but don’t overdo. Mixture will be lumpy. Pour into pan, drizzle with butter and and bake 45-55 minutes, until toothpick inserted in center comes out clean. Serve with more butter. To lower the fat (though it’s not that much) sub cooking spray for butter. It will help brown the bread. Previous Previous post: Champ or colcannon for St. Patrick’s Day – what’s the diff?